Josh Gordon seems as eager as ever to return to the football field as a New England Patriot. On his social media accounts Monday, Gordon shared a Patriots hype video and workout reel to his Instagram story. Gordon is still serving an indefinite suspension for multiple violations of the NFL’s drug policy. It is the same facility he was receiving treatment for substance abuse earlier in the offseason. Gordon can apply for reinstatement in May, but he’s been suspended five times since entering the NFL in 2012. During his State of the NFL address, Commissioner Roger Goodell was asked about the possibility of reinstating Gordon. “Directly I have not spoken to him since his last suspension,” Goodell said. “I do know he’s in treatment. He’s a young man who has had a lot of challenges. I have gotten to know him and understands his struggles and the challenges that he’s had to go through and he’s working at it. He understands what he has to do. He understand the importance for him — And this is well beyond football. This is for his life. — to make sure he takes care of himself and he understands the importance of getting this issue under control and being able to live a healthy and long life. In 11 games for the Patriots in 2018, Gordon hauled in 68 catches for 720 yards and three touchdowns. 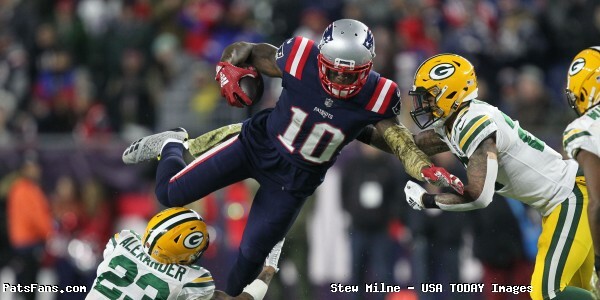 With the Patriots already thin at wide receiver heading into 2019 free agency, Gordon has potentially another opportunity to earn his way back to Foxborough. This entry was posted in Patriots Video and tagged josh gordon on March 5, 2019 by Robert Alvarez.